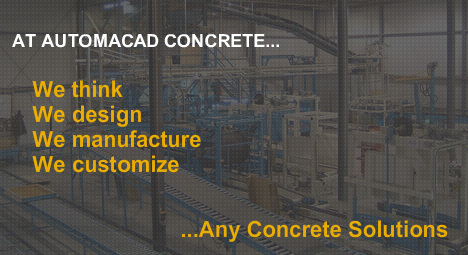 Automacad Concrete is a Canadian based manufacturer of concrete products machinery who provides custom made Innovative Concrete Solutions for Dry Cast and Wet Cast producers. Produce what you need, at the rate you need and the highest quality level! We take care of the rest by creating new concepts and equipment, modifying/improving machines and adding value to existing processes. Automacad Concrete, 240 Liberté Avenue, Candiac (Québec) Canada J5R 6X1 © 2008-2014, All rights reserved.